On Adly Road, going west from Opera Square is a tea shop called “Groppy” which serves the most delicious ice cream and sherbet I have ever tasted. King Hussein of Jordan is supposed to be extremely fond of it and reportedly he orders from the shop whenever he comes to Cairo. There is also a restaurant and grocery store with the same name on Talaat Harb Square, famous for its dried fish roe which is sold as a souvenir to foreign tourists. The famous Continental-Savoy Hotel stands in front of Opera House Square. An old hotel, it became the favorite of archaeologists engaged in the 1922 excavation of the tomb of Tutankhamen. From the balcony of the hotel, the view includes the luxuriant growth of the trees in the Ezbekieh Gardens, Mt. Mokkatthuam, the twin minarets and the beautiful soft green dome of the Mohammed Ali Mosque in the distance. The site where the mosque now stands was once occupied by the Citadel of Saladin, the fort of the brave Saracen warrior who broke up the armies of the Crusaders. 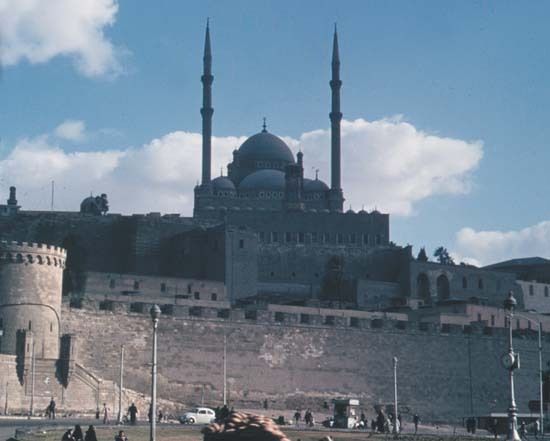 The area northeast and southwest of the citadel is a living historical stage crowded with exquisite mosques and the Khan-el-Khalili Bazaar, the City of the Dead, and Old Cairo. Son et Lumiire performances given every evening at the Citadel of Saladin relive the past. In a.d. 641, General Amr of the advancing Islamic army made his camp on the east bank of the Nile at the spot known as “Al Fustat” (The Tent) which later became the site of the city of Cairo. Amr Mosque, built by General Amr is the oldest mosque in Cairo. It still exists today at Al Fustat, as do the remains of part of the walls of the old citadel. At its height, this was a flourishing capital, second only to Bagdhad. With the discovery of a number of relics of Chinese pottery in the vicinity in recent years, there is growing interest in the theory that the Silk Road, which linked the Middle and Near East with China, may have come as far as Al Fustat. The town moved every hundred years or so, mirroring the changes in the dynasties. In a.d. 751, with a military dynasty, it was called Aska. In a.d. 870, this was superceded by Qataiya, which in turn was followed in 969 by a move towards the north with the advent of a new dynasty. During the Fatamite Dynasty (904-1171), the rulers ordered a new capital to be built. As the architects worked through the night to design the new capital, the light of the planet Mars, which they knew, inspired them. The name of this planet, Kahira, was given to the new capital. 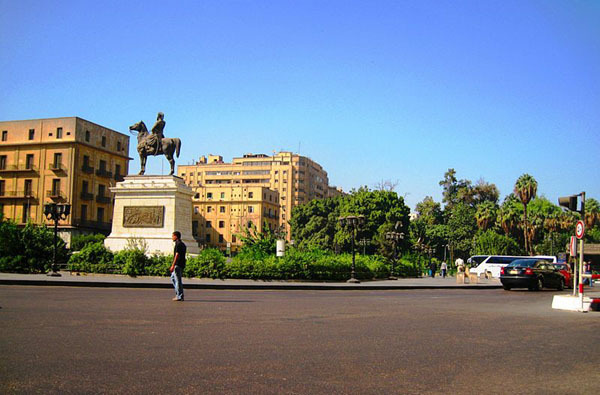 Kahira, which also has the meaning of “victory,” was rendered in English as Cairo the name of the present city. This is the story that is retold nightly on the stage of the old citadel. In the nineteenth century, Mohammed Ali, who had been dispatched by the Turks, lured about 500 Mameluke soldiers into the citadel, and then, suddenly closing the gates, killed them all just one tale in the bloody history of the citadel. Warriors killed in the battle were buried in the cemetry at the foot of Mt. Mokkatthuam. Old Cairo is pervaded by smells of earth and sweat. On entering this part of the town, one is bombarded by dust, noise and perfume. Foul-smelling piles of rotting fruit and vegetable scraps are thrown daily into the streets. Energetic children splash enthusiastically in the muddy puddles that spot the street. The area pulsates positively with life. But it also has several taxidermists’ shops, and it is a rather weird feeling watching a taxidermist prepare a stuffed animal or bird and wondering whether he would be able to undertake the mummification of a human being.